Cub fans take photos in front of "Goatbusters," this year's Halloween costume for the Wiener's Circle. LINCOLN PARK — With the Cubs having salvaged a win at home to force the World Series back to Cleveland, the Wiener's Circle settled down Monday to focus on Halloween in its new guise as "Goatbusters." "Crazy," said store manager Yolanda Smiley. "It's been busy and crazy." In its second annual Halloween stunt, the dog stand known for taking no guff from customers, especially late at night, became "Goatbusters" over the weekend. It wasn't just a surface costume, though. 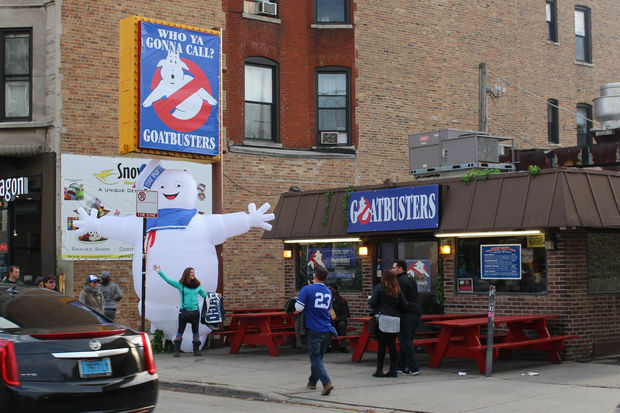 The Wiener's Circle, 2622 N. Clark St., designed a "Goatbusters" logo, playing on the 1984 Bill Murray movie "Ghostbusters," which ultimately was borrowed that year by the San Diego Padres and their fans in the lampoon "Cub Busters." The Wiener's Circle turned the tables on that this year, adopting the slogan "We ain't afraid of no goats," as in the Cubs' infamous Billy Goat Curse. 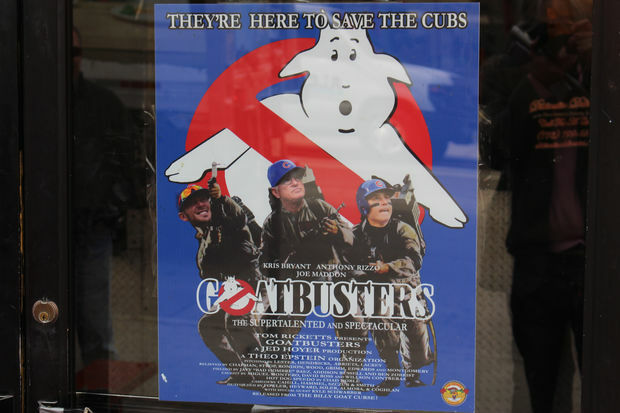 It also designed a "Goatbusters" movie poster featuring Cub manager Joe Maddon and stars Kris Bryant and Anthony Rizzo, stating: "They're here to save the Cubs." Plastic ivy mimicking the Wrigley Field outfield walls was put up throughout the dining area. Workers dressed in "Ghostbusters"-style coveralls, but also as Steve Bartman, the fan who deflected a foul ball away from the Cubs' Moises Alou five outs shy of the World Series in the sixth game of the ill-fated 2003 playoffs against the Florida Marlins. According to Smiley, no one has risen up to defend Bartman — and imagine the response from the famously surly help staff if anyone had. 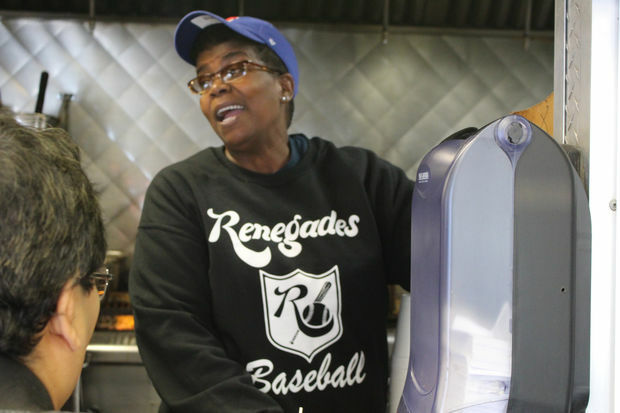 Wiener's Circle manager Yolanda Smiley sports a Renegades sweatshirt, a la Steve Bartman. 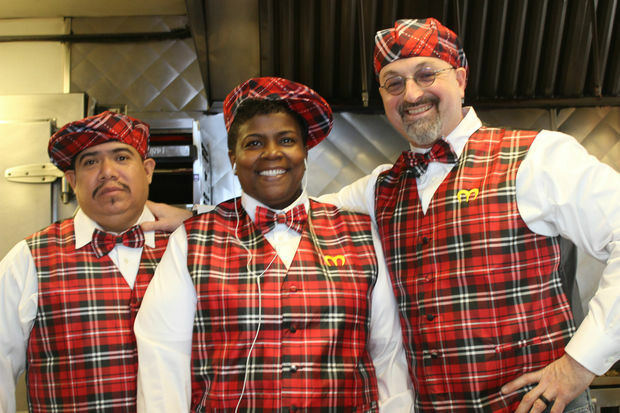 The Wiener's Circle even came up with a special "Holy Cow Menu" for its "Goatbusters" outlet, including a "Bartwurst" ("so good you'll want to grab it out of Alou's glove"), a Schwarburger, referencing the Cubs' Kyle Schwarber, and "Maddon Poutine." A 1908 special, referring to the last year the Cubs won the World Series, got a diner all three for $19.08. 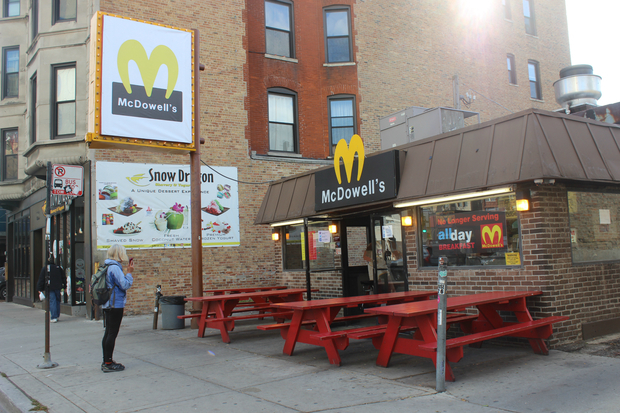 Last year, the Wiener's Circle adopted the guise of McDowell's, the McDonald's knockoff from the Eddie Murphy movie "Coming to America." Smiley said, "A lot of people are still showing support for McDowell's," and some expressed disappointment at not finding it back this year. In fact, Smiley said, even with the mania surrounding the Cubs, "I think the McDowell's was probably better" in the response it got out of Wiener's Circle customers. Jeremy Bauer, one of the Wiener's Circle owners, said they didn't notice a difference at the cash register. "It was an unbelievable weekend," he said. Of course, that public perception could change if the Cubs go on to complete their comeback from a 3-1 deficit in the best-of-seven World Series. They won the fifth game 3-2 Sunday night at Wrigley Field to force the series with the Indians back to Cleveland for a sixth game Tuesday and potential seventh game Wednesday. If so, look for "Goatbusters" to stick around as well. "We're big Cubs supporters, so I don't know how long we'll have it up," Bauer said. "But as long as they're winning we can't take it down."